Comic books and videogames – if there’s any two forms of media that consistently and repeatedly mirror each other in tone, content and character, it’s these two. The goal of so many videogames is to empower the player by imbuing them with superhuman qualities that set them above and beyond anything real life can offer. Comic books do the same, dropping the reader into fantastic worlds where brutal violence and epic heroism is merely status quo. The crossbreeding of these two mediums could only yield beautiful, exciting, violent children in the form of great superhero videogames, right? Hell, if you throw the awesomeness of Sega in there, each and every example of this magical gaming offspring is bound to be a shining, glittery gleeful package of joy, right? RIGHT? Well… Not necessarily. They are licensed games after all. That’s why I’ll be swinging in every week with a different superhero game, sifting through your Spidermans and your Xmens and your Batmans and all your other mans, to find out which of these creations are fit to wear the spandex or rubber or what-have-you. The first game I will look at is damn close to my heart. 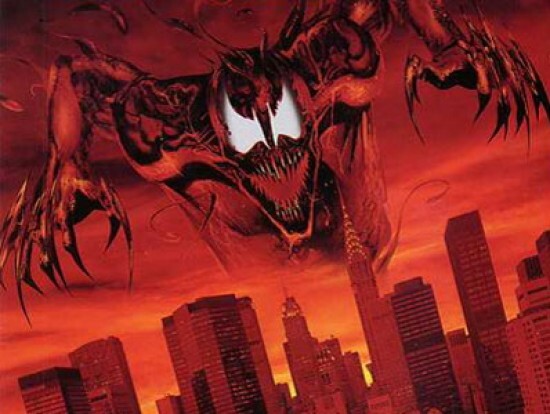 Carnage has always been one of my favorite Spiderman villains, representing the deepest, most maniacal depths that the franchise had really gone to up until then. He was truly monstrous, an inhuman serial killer whose bloodlust was manifested in the bloody hue of his symbiotic skin. When I saw that the game cartridge itself came in that same shade of crimson, I knew that this was meant for greatness. Did it live up to my hopes? Red games are automatically better. 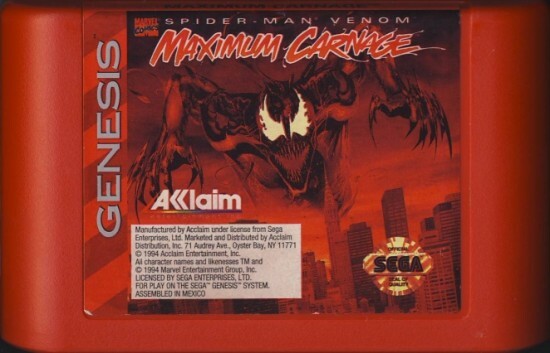 Spiderman & Venom: Maximum Carnage was developed for the Mega Drive/Genesis and the SNES by Software Creations and was published by LJN, a subsidiary of Acclaim. The game follows the pages of a comic book of the same name, in which serial killer Cletus Kassidy, AKA Carnage, escapes from prison and collects a fearsome foursome of supervillains to wreak havoc on a poor, defenseless New York City. In an unlikely cooperation, Spiderman and Venom team up, collecting their own clan of heroes to help put a stop to the chaos Carnage has ignited. 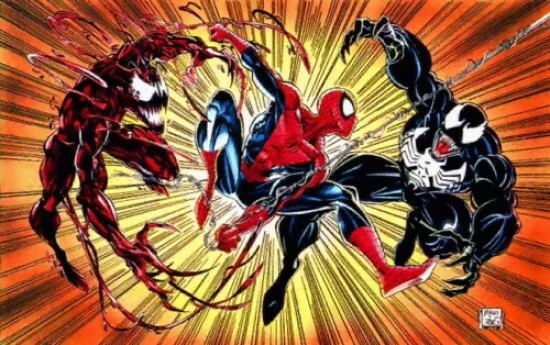 The book was one of the first major story arcs for Carnage, and presented the rather intriguing concept of two of Marvel’s starkest enemies joining to defeat a force that was stronger than the both of them. No caption. I just love this picture. One of the most common genres used during the 16-bit days was that classic Genesis trope, the co-op beat-em-up. It seems like a natural choice for something like Maximum Carnage – a story with two disparate characters working together in an urban environment, fighting off a veritable sea of nasties, most of which really have only one or two moves up their brightly-colored sleeves… Indeed, the genre lends itself nicely to most superhero stories, but this unique chance to have Brock and Parker working hand-in-hand lent the developer a very fresh and exciting opportunity – protagonist and antagonist, fighting together at once. As so many angry fans have pointed out (in a violent, jabbing motion), the game utterly fails to actualize this opportunity. Unlike so many games of the same ilk, Maximum Carnage pits you in a single-player experience, allowing you to play as both of the title heroes, but at separate points in the game. This seems alien not only to the game’s genre, but to the nature of the team-based crossover source material as well. While I once followed in those irate footsteps, feeling frustrated without a friend joining my side as Spiderman (“no, I called Venom. You’re ALWAYS Venom!”), I’ve realized with my recent playthrough that those criticisms really haven’t been fair. That choice to make the game a single player experience sets it apart from so many standard co-op beat-em-ups that pin you with your choice of character through the entirety of your playthrough, delivering the exact same repetitive mechanics over and over and over again. Obviously, this is the nagging flaw in the genre itself, but the opportunity to play as the two primary characters at different points in the game, occasionally sending you on alternate routes, helps to add a little bit of variety to a type of gameplay that is synonymous with repetition. Eventually, you can even switch between the two on the fly, adding a whole new element to how you play the later parts of the game. I will grant that the mechanics really don’t change much at all between the two characters. Both carry the exact same moves in their arsenal, but Venom’s animations are cooler to look at (his fist comes out as he punches, Battletoads-style), and call me crazy, but they seem a bit more cumbersome than Spiderman’s, trading agility for brute force. While the moves are the same between the two characters, they manage to remain fresh throughout the game, largely due to responsive, fluid controls. This allows for some surprisingly fast maneuvering that does a damn good job of replicating the iconic speed of these characters. 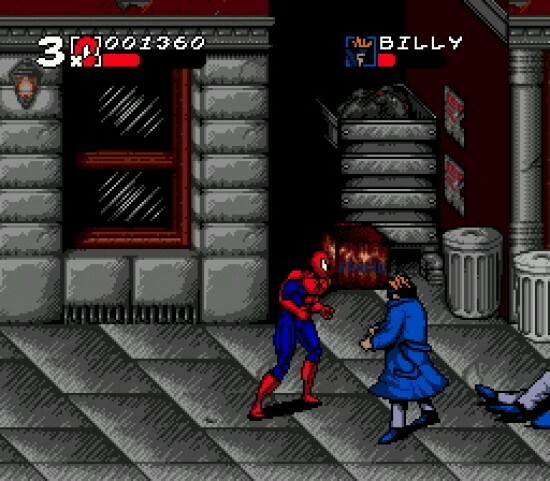 It is extremely easy to throw a couple very speedy punches, tie an enemy up in web, pick up another enemy, chuck him at the webbed enemy, then perform a special spin attack once they both get back to their feet. The best of all – God, I love it – is webbing an enemy on either side, and pulling both forward, slamming them together. It is so satisfyingly Spiderman. There’s also a “power move” system, that rewards the player for building up the consistency of their landed punches with one strong move that is almost sure to clear away the baddies in front of you. 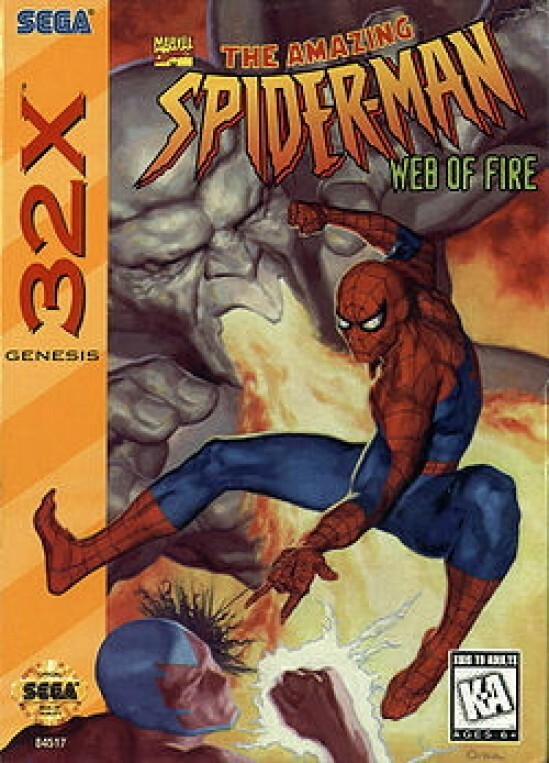 The web-slinging and wall-crawling is integrated into combat relatively well, though you may occasionally find yourself screaming at Venom for swinging in the direction opposite to where you intended. Even with the lack of co-op, another element helps to inject that feigned inkling of teamwork into the framework of the combat. Starting about halfway through, you can start picking up assist icons, which you can use to bring fellow heroes, Marvel Vs Capcom style, to assist you with one powerful move. This is probably my favorite aspect of the game. It is so cool to see so many underutilized, obscure characters being brought in as crucial game changers in such a well-known title. I got so damn excited the first time I saw Cloak envelope the screen with blackness, freezing eliminating all enemies, or when Iron Fist coming on to heal Spiderman. In fact, one of the game’s strongest points is the bounty of fan service it doles out by remaining surprisingly loyal to the book. Characters like Doppelganger, Morbius, Iron Fist, Captain America, The Vision, Firestar, the aforementioned Cloak and his right wing Dagger, all make an appearance. Most of these guys will never have games of their own, so it’s sure to grip and excite any Marvel fan looking for a game that delivers more than a simple punch-up between Hero #1 and Villain #1. By remaining so dedicated to the source material, the game is not too drowned in comic book camp. In between each level, the player is treated to rather gorgeous, digitized pages of a comic book with dialogue so fitting and well written that I’m never (OK, rarely) inspired me to roll my eyes. He's crazy serious, man! Why are you laughing?! Most of the entertainingly cheesy stuff comes from the genre clichés that come standard with those good ol’ side scrolling beat-em-ups. You know the drill – wholly unthreatening characters with bizarre names like Elmo and Bone and outfits that differ only in shirt color. It’s hilarious to think that a handful of dudes with goatees and backwards caps and girls who use their hair as weapons can possibly take town Spiderman or Venom. My favorite is this repeating character design that looks like a guy in a undone bathrobe and a crown. I’m sure it’s a trench coat and like, frosted tips or something, but… shut up. It looked like a damn bathrobe. 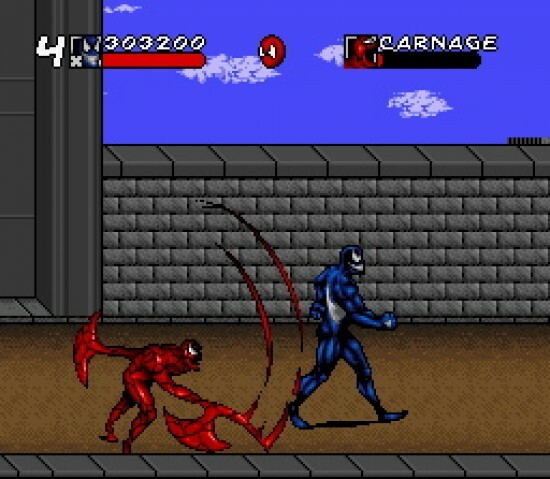 As a superhero game, Spiderman & Venom: Maximum Carnage is a damn good find. 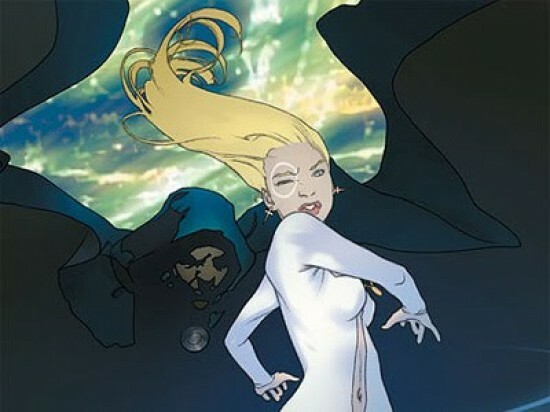 It has fan service bleeding out its bloodshot eyes, along with a surprisingly steadfast dedication to its father comic that you rarely saw back in those days. As a beat-em-up, its reputation is just a tad weaker for its lack of co-op and searing difficulty. But those complaints just don’t add up to me anymore. Due to fast, fluid gameplay and wildly varying assists, the game takes a fairly long time to wear thin. Getting to know the levels (and thus finding all of the hidden continues) helps to numb the difficulty quite a bit. If none of that convinces you, maybe this will: comedy-metal band Green Jelly wrote the meh-to-good soundtrack to the game. If you don’t know who they are, PLEEEASE check out their “Little Pig, Little Pig” video. Unfortunately, embedding has been disabled, but click here to be magically transported to the video of your dreams. So damn 90’s! Anyway, go find yourself a RED cartridge and get playing. This one is fit for the spandex. Green Jelly’s title track says it all: “Carnage Rules”. I loved this game, even without the Co-op! Red cartridges are always better. I’ll say! There’s something to be missed with this new disc based media. These days a red disc or a blue disc doesn’t mean a thing. But back in my day *waves cane* colored cartridges were a treat! This review inspired me to buy the actual Maximum Carnage graphic novel, until I found it and saw it was $48 in Canada.